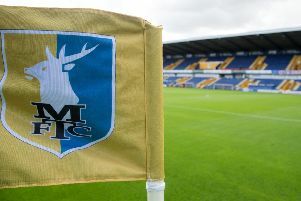 Mansfield Town boss David Flitcroft has called on his players to make a fast start against Crawley Town next Saturday, after the Stags overcame Yeovil Town to keep their hopes of reaching the League Two play-offs alive. A second half turnaround saw Mansfield twice come from behind through Lee Angol and Kane Hemmings before half-time sub Angol snatched an all-important winner at Huish Park to take their fight for a top seven spot to the final day. Stags sit just outside the play-offs in eighth after the 3-2 win over Yeovil, three points behind Coventry City who thumped Cheltenham 6-1 away and Lincoln City who lost 1-0 at Accrington Stanley on a day which also saw Wycombe Wanderers clinch automatic promotion. And, after the win over Yeovil, Flitcroft said: “It was a good win. The lads fought tooth and nail to try and gain the three points today. “I explained to them it was the last away game of the season and the travelling fans, who have been unbelievable since I’ve been here, have come a long way to be a part of this today and they deserve the chance to applaud the players after the game. A change in Stags shape caused the hosts problems. “The change in shape came just before half time. We had to give them more problems and play with a better intensity. First half we didn’t. We were waiting for something to happen as opposed to going to make it happen. “I believe in telling the truth to everyone. The players got a truth pill and after the game as well. I’ve told them football and life are exactly the same. I’ve been brought up very lucky to have a dad who told me exactly how it is. “The older generation accept it because that’s where we’re from. The younger generation I’m not too sure they get told and they get brought up with that level of truth in this day and age. Certainly there was more of an honesty about us second half. “There was definitely a tempo and we knew if we turned up with a tempo then we’d cause Yeovil problems and second half we did,” said Flitcroft, who was pleased with goalscorer Angol performance. “We’ve got to get the best out of Lee Angol,” he added. “Managers have told him in the past what they want from him and he’s delivered and then not delivered. Football is a quick time. It goes faster than any other time. You are retired so soon. “At 32, 33, 34 your career could be finished. When someone’s got that youth, energy, speed and power that he has got, he’s got to use it and use it all the time. It’s a gift he’s been given and he’s got to use it everyday to improve and use it every game. Angol’s goals helped to take Stags’ fight to get in the play-offs until the last day.